New is out and old is in! I really like the weathered look. The grain comes through and you can see the heart of your wood. Manufactured wood from the hardware store is easy to find and inexpensive to buy, but it doesn’t have quite the character as aged wood does. 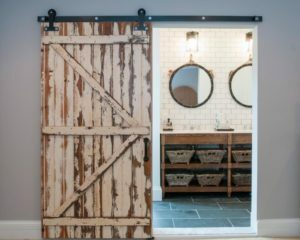 Turns out, you can have the best of both worlds by making any basic manufactured wood look reclaimed. 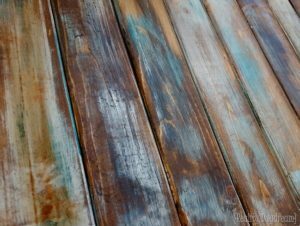 There are several ways to achieve the beautiful weathered wood look, here are 8 techniques that deliver the best results. This is probably the most popular, and the most obvious way to distress wood. Using any type of wood stain select two colors, one light and one dark. Start with the lighter color, and then wipe it off, and add a little dark color on top. Wipe it down again and you’re done. If you’re going for barn wood lookalike, you might want to try glazing. Simply mix four parts clear mixing glaze with two parts color glaze and one part antiquing glaze. You may have to adjust the measurements to get the color that you’re looking for. Once you have the basic color, brush the glaze onto the wood and rub it in. This is best for taking dark wood and making it look lighter. Make a solution of one part of baking soda and one part of water. And then either let the wood sit in the sun all day, or spray it with vinegar for a faster result. Brush the wood with a wire brush and you’ll see the dark color come off, you may need to apply this method two or three times to get the desired bleached look. Using paint to distress wood takes a little more time, but the results are beautiful. Start by painting the wood white, don’t go for perfect, just slap some paint on there. If you’d like, you can add another color on top like a deep teal, light blue, or grey. 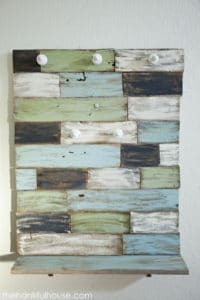 This weathered wood technique is the most popular currently and for good reason. It is beautiful! Once the paint is dry, take a coarse sandpaper to the surface to try and get the grain of the wood to show through the paint. Once you’re done sanding, stain the top with a brown stain. The visible wood grain will pick up the stain and blend with the painted colors beautifully. If you use this method, you’ll definitely want to seal the wood after you’ve finished to ensure a longer life for your beautiful piece. This is a pretty popular method online although it does take some prep time. Before you begin, you need to soak steel wool in a jar of vinegar. The goal is to create an iron/vinegar mixture. How long to soak the wool depends on the type of vinegar and the type of wood you’re using. Darker vinegar is quicker, while lighter variations may take some time. Leave the wool in the vinegar anywhere from 24 hours up to 5 days. Meanwhile, brew some very strong black tea, and let it sit for just a few hours. Apply the tea to the wood first using a brush or a cloth, and wipe off the excess. 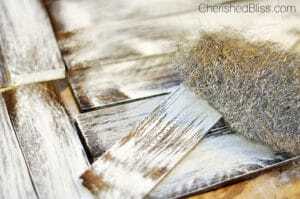 Then use a paintbrush to apply the iron/vinegar mixture in even strokes along the grain of the wood. 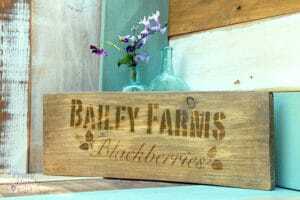 Let it dry and give it a good sanding to reveal your new reclaimed wood. This is a simple technique that gives a beautiful look to wood. Simply use a blow torch along the gain of the wood. The heat from the blow torch gives a blackened look to the wood. Be careful not to overdo it, and finish it off with a sealant. 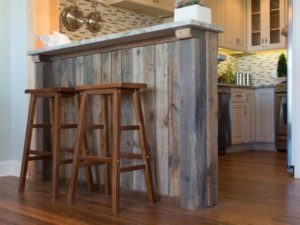 I hope this inspired you on your next DIY project, and gave you more information on what technique of weathered wood is best for you. Comment below if you have any questions! This is amazing! I didn’t realise there were so many ways to “weather” wood. Think I’ll give the tea a go – thanks for the tips.